Mrs.Janhvi Kaustubh – Brookefield, Bangalore. Apollo Cradle has provided us with superior quality in terms of service. The entire hospital is a very well coordinated system with no loopholes. There are no delays and there is rarely any waiting time. Dr Aparna Jha is friendly, approachable, and reliable. The support staff is well behaved. The rooms are clean and hygienic and all amenities are available. The meals are healthy and delicious as well. Satisfactory service from Apollo. Mrs. Dr Teena Thomas – Brookefield, Bangalore. I have such special memories of my experience at Apollo Cradle. There were no shortcomings in the services provided. Dr Aparna Jha is great. She is very friendly and understanding of the patient’s needs. She is a patient listener and helped me throughout. The premises of the hospital were clean and hygienic at all times; the administrative staff was well coordinated and everything was in order at all times. There were no delays or problems whatsoever. My experience with Apollo Cradle under the care of Dr Aparna was great. Dr Aparna is qualified and experienced. She is knowledgeable, understanding, and very friendly. The nursing and support staff, including housekeeping is very helpful and prompt. They were always on their feet providing the best quality care possible. Great job by team Apollo Cradle. Mrs.Mary Stella – Brookefield, Bangalore. I had an amazing time with Apollo Cradle. Dr Aparna really understood my needs and did whatever she could to make sure they were met. The staff is very courteous and professional. The hospital was clean and very hygienic at all times. We did not face any procedural delays either. Great service by Apollo Cradle. Apollo Cradle is amazing. Dr Aparna and her team is meticulous and exceptional in providing care. She gave me all the information I needed and I felt so comfortable with her. I did not face any troubles throughout and the staff was extremely courteous and helpful. The administration is well run and smooth and there are no delays whatsoever. Mrs.Swetha V R – Brookefield, Bangalore. I got admitted under the care of Dr Aparna Jha in the Apollo Cradle, Brookefield. It was a much more relaxed, calm, comfortable environment than any other hospital. The staff is very understanding and accommodating and they handled everything well. I did not face any problem throughout. They are dedicated professionals providing great care. I would definitely recommend Apollo Cradle to my friends and family. I got to know about the Apollo Cradle, Sarjapur through a friend and chose it for my delivery. As expected, the clinic is very well maintained. The PRO helped us choose a package and the front office team cooperated well. Dr Aparna Jha and nurses make your stay comfortable and listen to all your concerns. The food in the canteen is very healthy. Though the rooms are good, the housekeeping services can be improved for a better experience. I was admitted to Apollo Cradle, Varthur for the treatment. Dr Aparna Jha was the consultant gynaecologist. She and her team made us feel comfortable and at ease. The housekeeping staff was also very efficient. The front office team was very cooperative and made the admission and discharge process very simple. My experience was good and I will surely recommend Apollo Cradle to my friends. I have had an experience of a lifetime here at Apollo Cradle, Brookefield clinic. Dr Aparna Jha and her team is just awesome. This clinic had some excellent doctors and the staff is equally good. It was a smooth process right from admission. The staff is cooperative and give you a homely feeling. The canteen and housekeeping staff is also very efficient in their work. I will surely refer this further with good comments. We chose Apollo Cradle, Whitefield for the delivery after hearing good reviews and I am not disappointed. Doctors like Dr Aparna Jha make you feel at ease. The nurses take utmost care and ensure your comfortability. The front office is very cooperative in handling queries and resolving issues. Food quality is very good. They can improve on housekeeping services and billing is also not available 24/7. I am certainly going to recommend this clinic. I visited Apollo Cradle, Whitefield for a procedure. Dr Aparna was there to assist us. I liked the overall experience. We got full support and cooperation from the clinic staff right from the moment we entered. The nursing staff takes care of all your needs. The food is healthy and available. The housekeeping staff is very polite and maintain the rooms very efficiently. The infrastructure is also great. 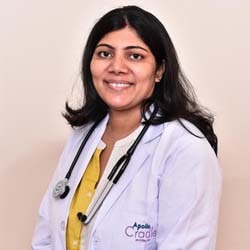 Dr Aparna Jha was our consultant gynaecologist at the Apollo Cradle, Brookefield. Having heard so much about it, we chose this clinic for my delivery. With the help of the PRO we chose a package and got admitted. The front desk team was helping and completed the formalities without wasting any time. The rooms were well maintained but there was some issue with the AC. The doctors and nursing staff made it a good experience. I have had an amazing experience at the Apollo Cradle, Whitefield when I was admitted there under the care of Dr Aparna Jha. Everything here right from front office to housekeeping and kitchen staff is very friendly and cooperative. The doctors and nurses are very supportive and easy to communicate. They take great care and make you feel homely. The critical units also provide sound infrastructure and great care. I am greatly satisfied with the services. I was admitted to the Apollo Cradle, Marathahalli after a friend recommended it. We received the best of services here and will surely recommend this one. Dr Aparna Jha is very skilled and dedicated and the nurses are supportive too. The rooms are very well done, housekeeping is brilliant, the food quality is very good and served on time. Kudos to the staff and management for the quality experience. We had a memorable experience at Apollo Cradle and all our expectations were met. It’s hygenic, the staff is efficient, the doctors are highly renowned. We will definitely recommend Apollo Cradle to other parents to be. I had undergone a good treatment here in Apollo Cradle, and I must mention that everyone on the staff team here is very efficient, cooperative and supportive. We were happy to choose this centre and will surely recommend our friends and families to come here too. We were very happy with the service and treatment you gave to me and my new-born. It\’s really important for regular check ups for the mother and baby, and thank you for taking excellent care round the clock. Dr. Aparna Jha, you were excellent, and my thanks to all the support staff too. Dr. Aparna Jha and Dr. Bhavani are outstanding, co-operative, skilled & experts in every aspect of treatment. Some of the sisters like Sarita are also highly skilled. Moreover Apollo Cradle’s staff service, behaviour, infrastructure, treatment is outstanding & it focusses mostly on “NATURAL BIRTH” which is very good & we really appreciate it. Apollo Cradle’s nurses and the front desk team are very friendly and helpful. Their expertise in their fields make life easy for us patients. Thank you Dr. Aparna Jha for being such a good guide and friend, and thank you to everyone else in the team. Good care by nurses, housekeeping staff, front desk and of course, the doctors. They are highly respected and renowned and I am happy I came here for my delivery. Best wishes to everyone in the staff of Apollo Cradle. People are very helpful in Apollo Cradle and I was glad we chose this centre for me delivery. The staff makes sure you are very comfortable at all times, and they check up on you regularly. Thanks to all the doctors for all their help and guidance. Staff nurses are good, and they were always on their toes keeping an eye on the patients and being ever ready to do anything to make them comfortable. My doctor, Aparna Jha was a great support and I\’m happy she guided us so well. The overall environment at Apollo Cradle is good. Everyone in the staff was prompt when it came to tending to the needs of a new mother and her baby. My doctor, Aparna Jha was a good guide to have with us, and I\’d like to thank everyone in the team for giving me and my baby a comfortable stay. The nurses here are very good, they are very helpful and awesome with their job and very friendly too. Overall, I\’ve had a nice experience with hospital & all the members of the staff. Special thanks to Ms. Sandhya Rao for doing such a good job on the billing front, and patient interaction too.